Today we had another staff meeting. 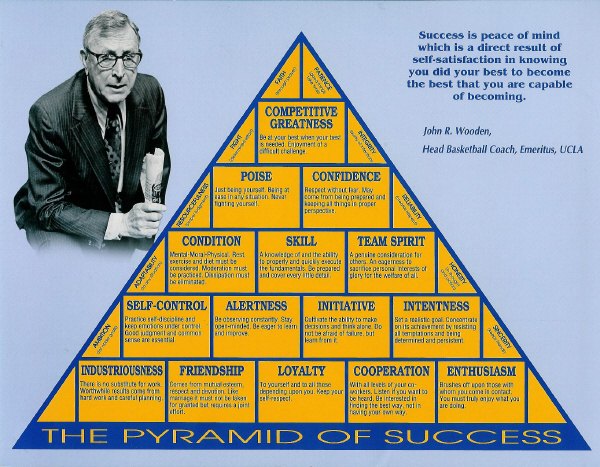 This time we discussed the three “blocks” of John Wooden’s Pyramid of Success that are in the center. He refers to them as the Heart of the Pyramid. The first block refers to condition. This goes well beyond physical condition. He is referring to a good mental and moral condition. “When you are lacking in good mental condition this disrupts the team.” I agree with this. It also reminds me of a book called “Fish”. From the moment we wake up in the morning, we have the choice to either make it a great day or we can ‘choose’ to let our mood or events dictate our mood. Sometimes this can be a difficult task but we are all ultimately responsible for our own attitudes. The third block is team spirit. I especially enjoyed this block. It refers to our attitude about our contribution to the “team”. John Wooden explained that he changed the meaning of this. The original meaning was: a willingness to sacrifice personal interest or glory for the welfare of all. He felt there was something missing. Then he finally got his answer and changed it to: An “eagerness” to sacrifice personal interests or glory for the welfare of all. I see that with my own staff. There are those who are always eager to help and those that are willing, however not always eager. There is definitely a positive feeling from that eagerness! Our next meeting will focus on the top of the pyramid. I find this to be a very helpful management tool for me to share with my staff. I think everyone enjoys our meetings because they inspired us all by his words and we can relate to them. It isn’t a meeting where the typical “problems” are rehashed. I think it makes us all do a little private self evaluation. It gets everyone back on track until the next meeting. We hold them the first Wednesday of every month. It seems to be the right amount of time before everyone needs a little checking in.